One of the advantages of relying on public transport is that you end up standing around in parts of the city where you might not otherwise loiter. It was a very pleasant surprise then for me to spot the sign on the side of the National Museum on Kildare St identifying the small square I was standing on as Kildare Place. I’m a little embarrassed about confessing this—I knew it was around Kildare St somewhere, but had never really thought about where. Having spent a lot of the last two years thinking about the Society that was located in Kildare Place (that’s a cheap link to my new book), now that I was there, a lot fell into place. 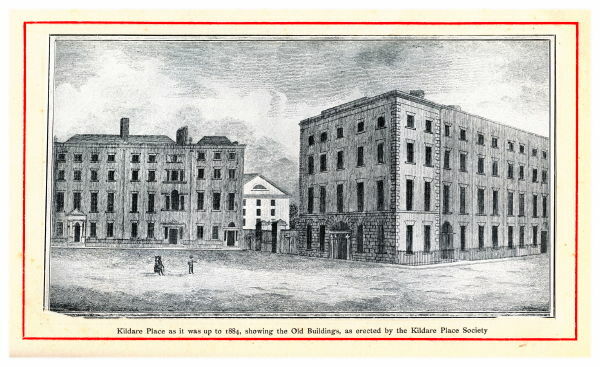 The Kildare Place Society, more correctly the Society for the Promotion of the Education of the Poor in Ireland, was established by a group of businessmen (Bewley, Guinness, La Touche, etc) in 1811 with the aim of developing a primary education system in Ireland. Over the following twenty years, the Society moved to a position where it established teacher training schools, published over a million schoolbooks, and promoted a secular model of education which ultimately became the basis of the National School system, established in 1831. 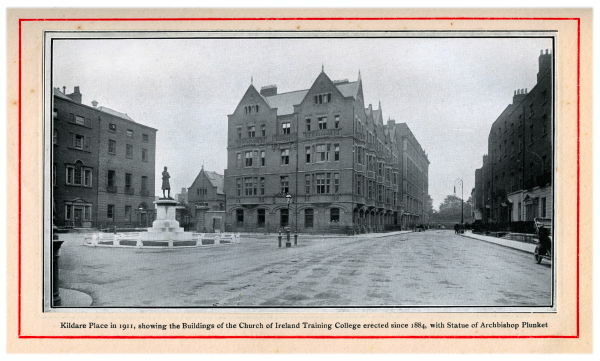 Although the Society’s demise began after its funds were transferred to the National Board in 1831, it continued on as a Protestant education society (Church Education Society), and ultimately the Church of Ireland Training College. A picture from 1911 shows the training school built on the site in 1884. 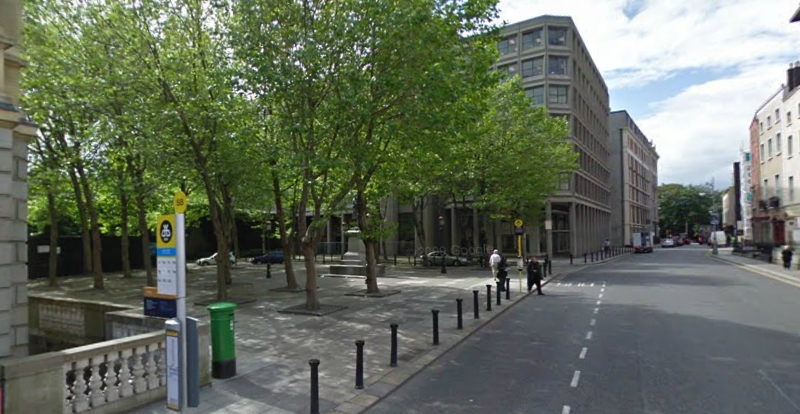 That building is now the site of the Department of Agriculture, and the only memorial to the first substantial national effort for education provision in Ireland is a street named School House Lane East, across the road. Kildare Place is also famous, or infamous, for the destruction of two houses on its eastern edge, visible to the left of the 1911 photograph. These houses were built by Richard Castle for Lord Massereene and Sir Skeffington Smyth sometime prior to 1750. (By coincidence, Castle also designed Tyrone House, which became the home of the National Board of Education). After the earlier destruction of No. 1 for the National Museum and No. 4 for the Training School, No. 2 and No. 3 were the only two left on the square. In 1957, it was decided to tear them down. Vandalism of this kind should not be tolerated. We look to the Commissioners of Public Works to preserve our heritage, not to set a lead in destroying it. Sir, As the Georgian Society seems to have lapsed, has anyone any objection to my restarting it? Our aims are to bring the photographic records up to date, publish further volumes of the Georgian Society’s books, and fight for the preservation of what is left of Georgian architecture in Ireland. The Irish Georgian Society was set up the following year. The only survivor at Kildare Place is the statue of Archbishop William Conyngham, 4th Baron Plunket, erected in 1901. He still stands, looking over at 20 Kildare Street. which contains a very similar first floor window as that on Castle’s building on Kildare Place. This building is sadly in an advanced state of deterioration, as described more fully in this article on The Irish Aesthete website. 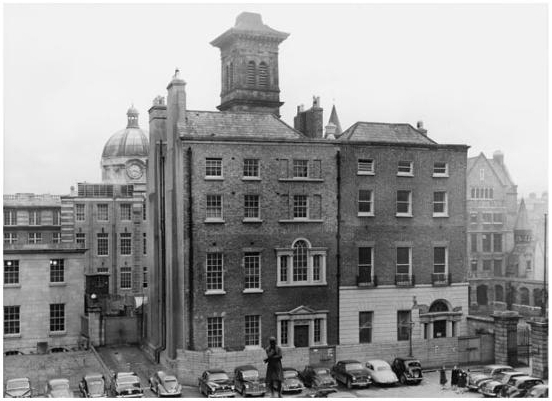 Kildare Place, prior to its destruction in 1957 (Hanna, 2013). Archbishop Conyngham is just visible at the bottom of the photograph. Erika Hanna (2013) Modern Dublin: Urban Change and the Irish Past, 1957-1973, Oxford.